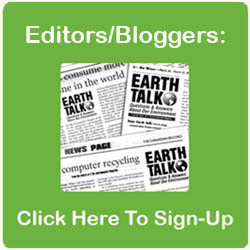 Dear EarthTalk: How can I recycle my old mattress if the place I buy a new one from doesn’t take it? What do mattress companies do with old mattresses when they do take them? Do they recycle any of the material? Don’t toss that old mattress out onto the street! A number of companies and nonprofit agencies now accept mattresses, break them down and recycle their component parts for new uses. To see if there’s one near you, go to earth911.org and locate by zipcode. Credit: Alan Stanton, FlickrCC. The Lane County, Oregon chapter of the charity St. Vincent de Paul Society, for example, has spearheaded one of the nation’s most successful mattress recycling initiatives via its DR3 (“Divert, Reduce, Reuse, Recycle”) program. “Keeping [mattresses] out of landfills is a matter of efficiently recycling them so their core materials can be reincarnated into any number of new products,” reports the group, which opened a large mattress recycling center in Oakland, California in 2001. (Why hundreds of miles away in Oakland? To “go where the mattresses are,” says Chance Fitzpatrick of the group.) The facility has been processing upwards of 300 mattresses and box springs per week ever since. While the DR3 facility only takes mattresses from a small group of waste haulers and individuals around the San Francisco Bay Area, other mattress recyclers are popping up around the U.S. and beyond. Some examples include Nine Lives Mattress Recycling in Pamplico, South Carolina; Conigliaro Industries in Framingham, Massachusetts; MattCanada in Montreal, Québec. To find a mattress recycler near you, consult the free online database at Earth911.org. Of course, some states (California, Connecticut and Rhode Island, among others) have enacted so-called “Bye Bye Mattress” legislation requiring mattress sellers to remove and recycle customers’ old mattresses at no charge upon delivery of a new mattress. California’s version of the law tacks an $11 fee onto the sale of all new mattresses in the state to pay for the recycling program, which also allows anyone to drop off old mattresses for free at various collection sites. Still yet another option is giving that old mattress away. But many health departments prohibit donating mattresses to charities like the Salvation Army or Goodwill. So what’s an upgraded sleeper with a perfectly good old mattress to do? The web-based Freecycle Network allows people to post stuff to give away to anyone willing to come pick it up; likewise, chances are your local version of Craigslist also has a “free” section where you can post that it as available. For even more ideas, check out Tuck.com’s handy and helpful Mattress Disposal Guide….